I have long been of the impression that most of the gender gap in academic achievement is skewed towards lower SES groups and URMs, that much of it has much to do with a comparative lack of male engagement in primary and secondary school, especially with respect to home work compliance, so I decided to exploit my prior efforts to try to assess the accuracy of this view. Of course this data isn’t broken out by race or SES per se, but the right side on the x-axis is generally higher SES and more white and asian (whereas the left side is generally more black and latino and generally lower SES). To my eye, it looks like the female lead in English (verbal skills) generally shrinks in later grades (some of which may be the product of higher male drop out rates) and in higher performing schools. It looks like there is little, if any, gap in elementary school math, but that a small but consistent gap opens up around high school and that this gap generally increases in higher performing schools. There is a non-trivial gap in several of the sciences and this gap generally grows in higher performing schools (note: there are few data points 4SD out and that are apt to be magnet schools). There is a significant gender gap in history and this gap grows in higher performing schools. It looks pretty clear to me that the primary issues males face today has less to do with measurable differences in academic skills than other stuff. 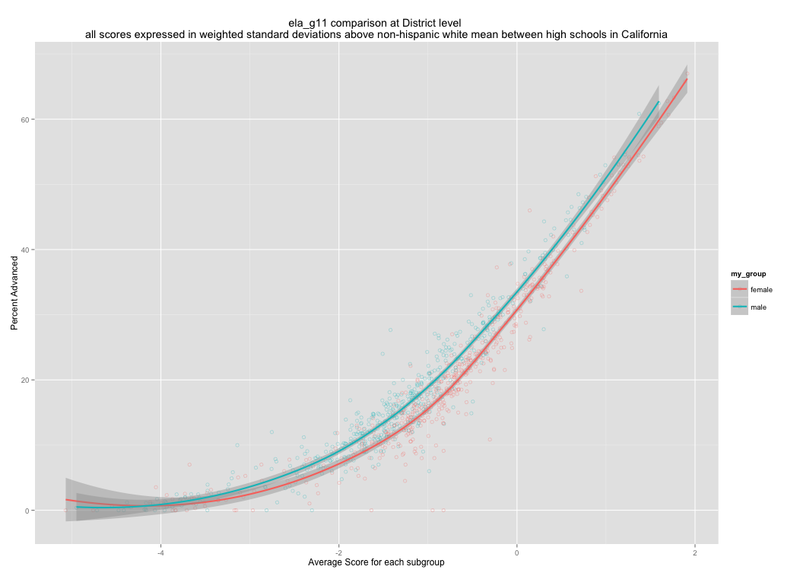 By high school males are performing better than females in most subjects on average in California. Even in English, a traditional female strength, the gap is not particularly large. Given that the gaps generally move in a more favorable male direction in higher performing schools on these tests, it tends to support the notion that this has more to do with compliance, home work, and occupational choices (e.g., females pursuing occupations that require education/licensing at a higher rate–see teaching, nursing, etc). Of course, it’s worth pointing out that averages only tell part of the story. Male variability is larger across most traits and intelligence is certainly not an exception. Even when the mean scores are equalized this extra male variability is apparent on the left and right tails. Put differently, some these achievement gaps are reflected in the actual score distributions, but much less so at the median or means than at the tails. There are significantly more males that are poorly qualified for college (which partially explains why there are male dropouts in HS and beyond), but, at the same time, there are also generally even more men, proportionally speaking, that are better qualified for a rigorous college education (especially more quantitive or scientific subjects).